8 Symbol is used to activate Flying Star 8 White which oversees wealth and fortune. Water represent wealth in Feng Shui. This 8 Water Feature combines both. 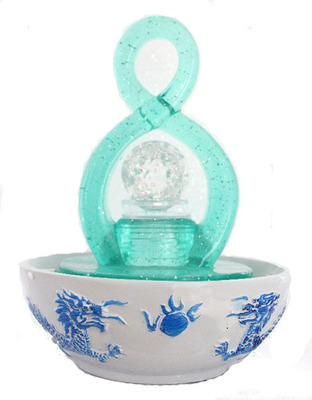 There are beautiful blue dragon and blue mystic knot on the bowl to present good luck, success and harmony When you plug in, water will be pump up and make the crystal ball running. In addition, LED light under the ball reflect to the crystal ball enhancing its beauty. Pump and crystal ball are included. The dimension of it is approx. 7 1/2" x 7 1/2" x 10".